For the New Year’s good fortune, black eyed peas or other beans are considered conducive to success; encouraging wealth and prosperity. I am hoping that 2018 brings lots of awesome things for my family, friends and fans. We deserve it, don’t we. Hubby and I are right in the middle of a kitchen remodel so we are a little stressed this New Year. We consider ourselves very fortunate to be able to do this kitchen remodel but we keep hitting lots of issues and road blocks. As I have always said once you estimate how much something is going to cost tack on about thirty percent more and you might be getting close. 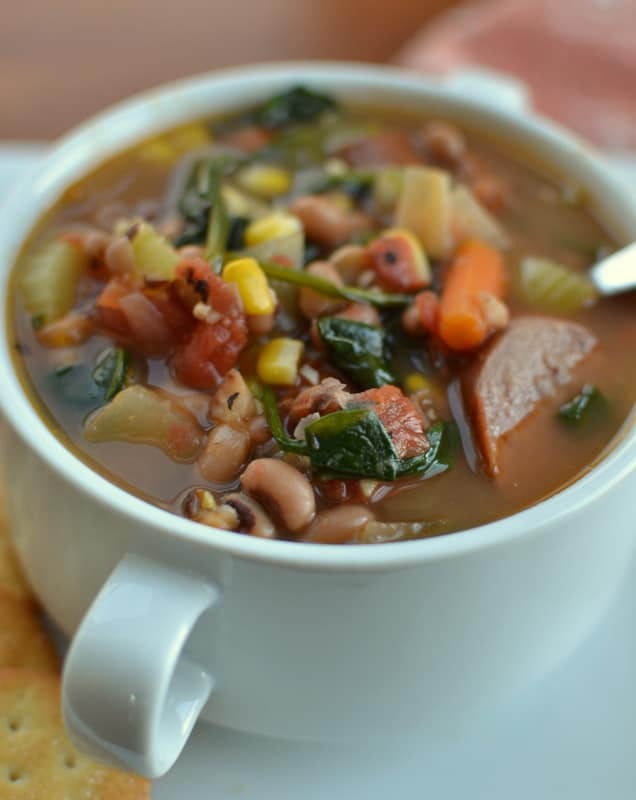 We eat black eyed peas all year long as we find them delicious and nutritious! 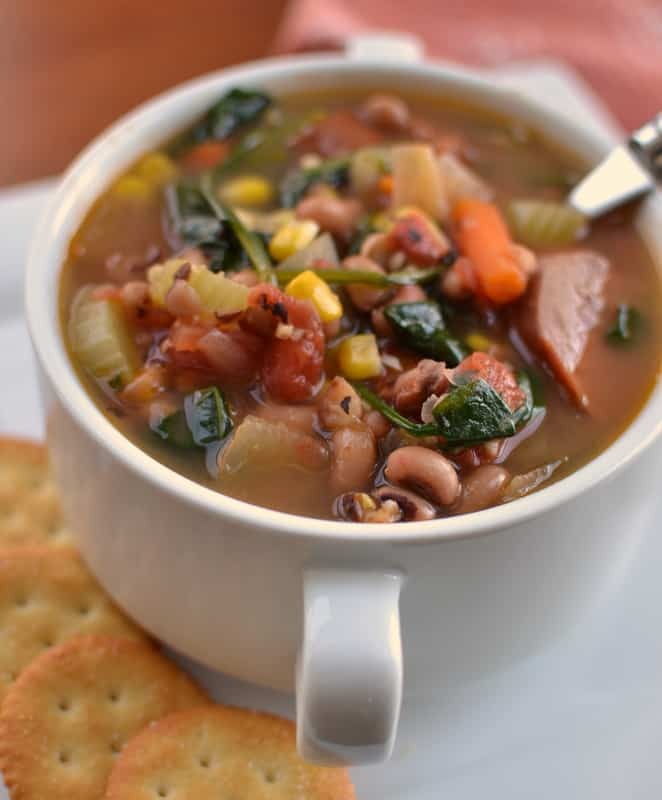 This Black Eyed Pea Kielbasa Sausage Corn Chowder brings it all together in perfect harmony with onions, carrots, celery, garlic, tomatoes, corn, spinach and a perfect blend of spices. I use canned black eyed peas so this comes together in about thirty minutes. It is delicious, nutritious and oh so easy. Have you tried any of my other delicious soups? 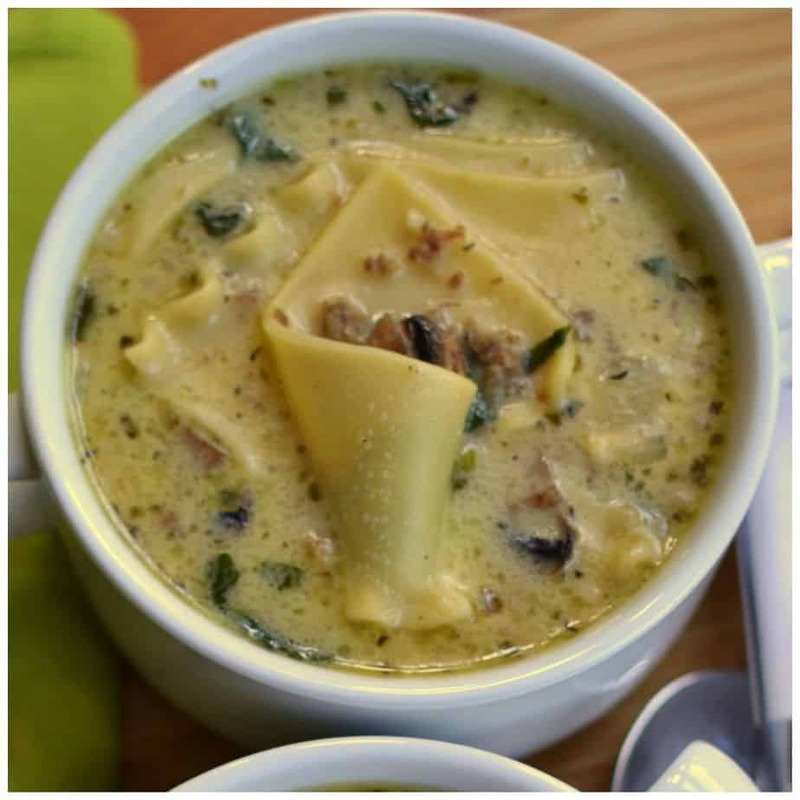 Sausage Potato Cheddar Soup, Easy Beef and Barley Soup and Sausage Penne Soup are some reader and family favorites. I absolutely love soup no matter what time of year it is. 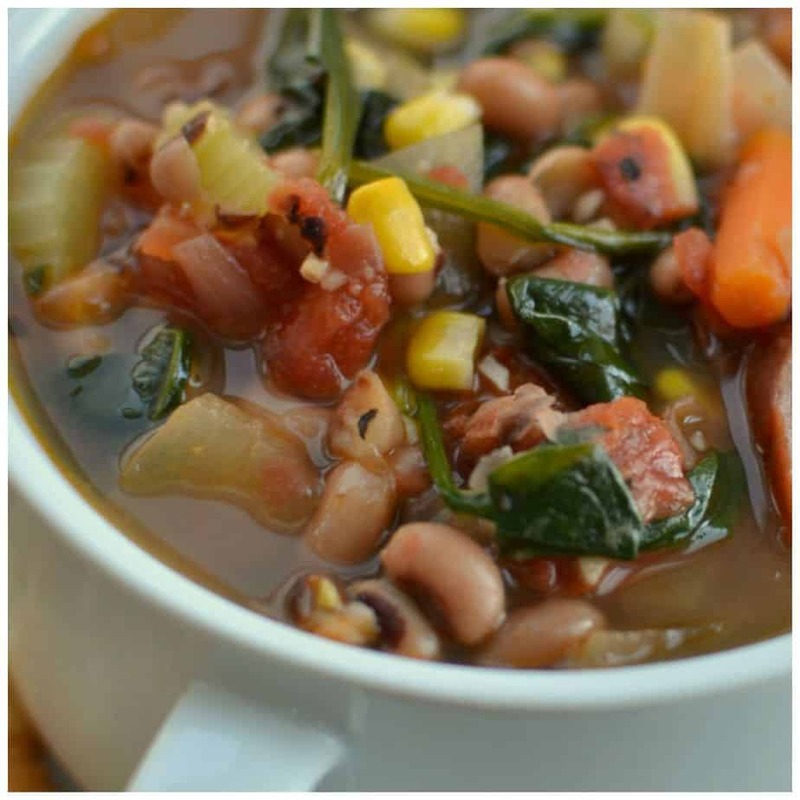 Another favorite black eyed pea recipe is Slow Cooker Black Eyed Peas from my blogging friend Dinner at the Zoo! 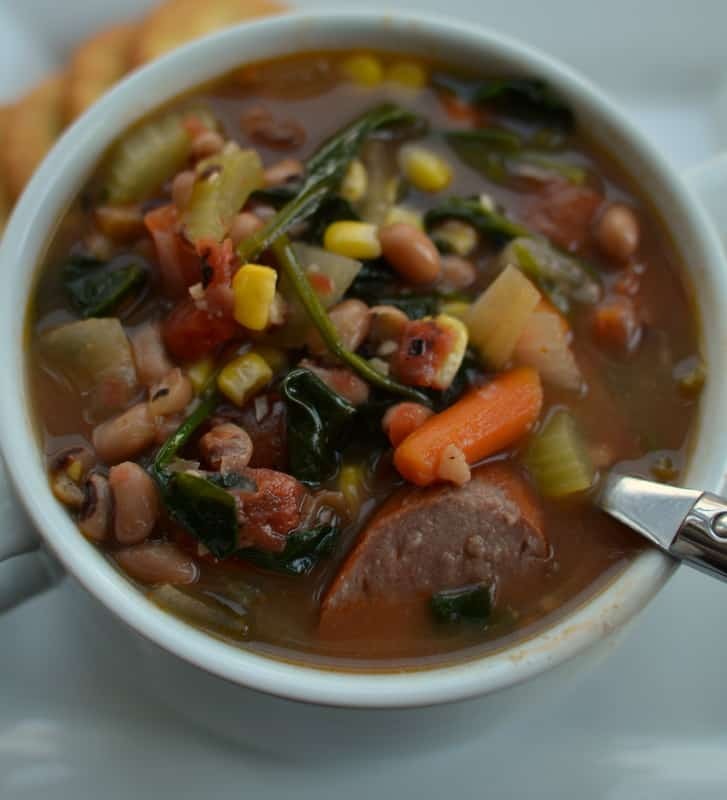 So if you are into hearty delicious meals that are dependable and cooked in short order but taste like you spent hours than this Black Eyed Pea Kielbasa Sausage Corn Chowder is for you. Put the ingredients on your shopping list and let me know what you think. In large stockpot or dutch oven over medium heat canola oil. Add sausage and lightly brown; about 2-3 minutes. Add onion, celery and carrots. Cook for additional 2 minutes; stirring frequently. Reduce heat to low and add garlic, cumin, Cajun seasoning, paprika and pepper. Cook for 1 minute; stirring constantly. Add chicken broth, black eyed peas and corn. Simmer for 20 minutes or until the carrots are cooked to your desired tenderness. The added Cajun seasoning is very mild and complements the soup well but if it concerns you omit it. The soup will still be delicious albeit a little more mellow. 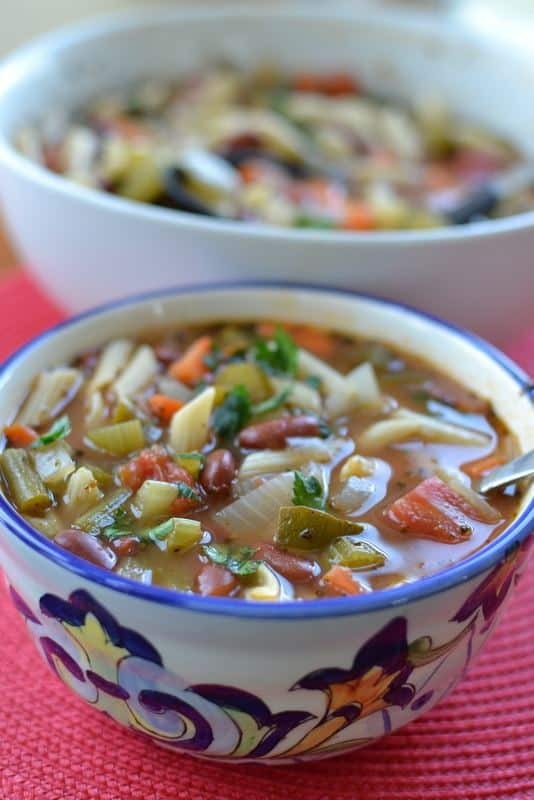 Other soups you will love!